As early as the Old Kingdom, the god Ptah of Memphis formed close links with the funerary god of the city, Sokar, leading to the creation of the god Ptah-Sokar. In later times this god also acquired the characteristics of the god Osiris, resulting in the god Ptah-Sokar-Osiris. 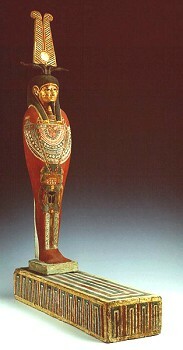 Statues of the god often formed part of the tomb equipment in the Late Period. They usually show a mummy with a human head standing on a base, wearing a crown with horns. Some statues have the head of a falcon. Occasionally, there is a small falcon on the base in front of the god and facing him. In a number of instances the statue of the god, or the base it stood on, hid a funerary papyrus. Often this is an example of the Book of the Dead, but other netherworld texts have also been found, for example the Amduat. Sometimes other papyri irrelevant for the deceased have been found, apparently sold to him as copies of the Book of the Dead but actually old, discarded administrative texts or the like. Because only a small percentage of the Egyptian population could read, this swindle apparently went undetected.